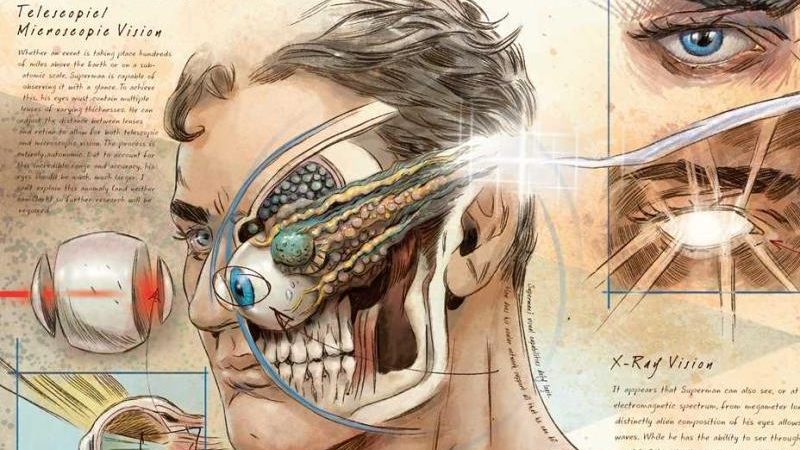 A closer look at the eye-based abilities of the Man of Steel, as seen in Anatomy of a Metahuman. Ever wanted to know what the inside of Superman’s eyeball looks like? Well, now you do, in stunningly beautiful detail. Coming this September, Anatomy of a Metahuman is a DC Comics reference book filled with comic-book science about just how the superpowers of DC’s greatest heroes and villains actually work. Cover art for Anatomy of a Metahuman, featuring the Vitruvian Superman. As intriguing as this book already is—simply as an art book alone—what makes it extra delightful beyond Doyle’s beautiful illustrations is that Anatomy of a Metahuman is actually presented as an in-universe text, with insights (and presumably the illustrations) coming from none other than Bruce Wayne himself. I just love the idea of Batman not only having dossiers on all his friends and foes tucked away, but also just deciding to illustrate himself an entire, hugely detailed anatomical book in his spare time to boot. That’s the Dark Knight for you! Anatomy of a Metahuman is due out this September.